A single diamond solitaire pendant will always be adored for its classic and elegant beauty. 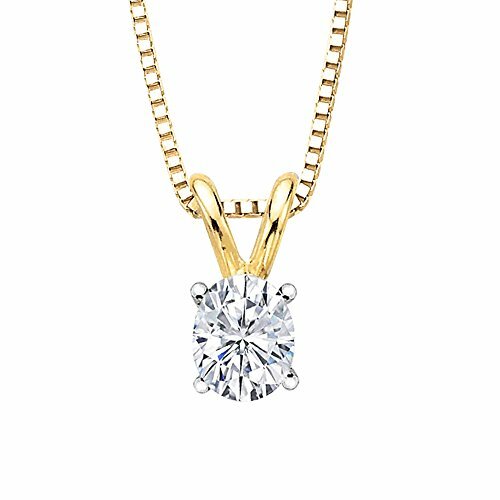 This 1.01 ct. sparkling oval cut Diamond is masterfully prong set in a well crafted Gold pendant. Available in yellow and white gold, please contact us via phone or email. Lovely Gift - Gifting this classic design is an incredible way to express your admiration towards your loved one. Excellent gift choice for Birthday, Anniversaries, Holidays and other special occasions. The diamonds used have been purchased from legitimate sources not involved in funding conflict and in compliance with United Nations resolutions. The seller hereby guarantees that these diamonds are conflict free, based on personal knowledge and/or written guarantees provided by the supplier of the diamonds.. Call us to know more about this design 888-528-2746. Comes with the Certificate - This Solitaire is Made in USA.